Wangen is acquiring Knoll’s progressing cavity pumps division. Pumpenfabrik Wangen GmbH is acquiring Knoll Maschinenbau GmbH’s hygienic progressing cavity pumps (MX range) division with effect from 1 April 2019. In recent years, Wangen has expanded its hygienic pump range with the Hyline progressing cavity and Twin NG twin screw pumps. Now, Wangen will add Knoll’s MX range of pumps to this business area. With their modular design and robust construction, MX progressing cavity pumps are ideal for use in the hygienic field, as well as in the chemical, paint, lacquer and paper industries. A key feature of the MX range is its EvenWall® technology version, which offers significantly higher pressure stability. The pumps also have high hygiene standards around the joints and seals. “We are adding the leading hygienic progressing cavity pump to our strong hygienic twin screw pump range, offering customers in future a considerably wider range from a single supplier,” said Markus Hofheinz, managing director of Pumpenfabrik Wangen GmbH. The MX range will be handled through the Wangen sales network and existing Knoll sales partners. The acquisition is an important milestone in Wangen’s long-term growth strategy, developed and implemented together with its majority shareholder Silverfleet Capital. 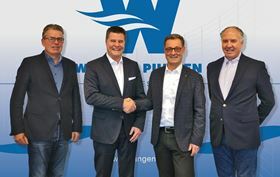 “Knoll’s progressing cavity pumps complement Wangen’s portfolio of pumps excellently, particularly in the field of hygienic and industrial applications and will not only help us to further penetrate our key markets, but will also support our continued international growth,” added Hofheinz. Knoll is planning to focus on its core business – products for chip and lubricant management in metalworking. “For our progressing cavity pumps unit we were looking for a buyer who wants to further develop the business and will continue to deliver high standards in quality and service for our long-standing client base. With Pumpenfabrik Wangen we have found the ideal partner,” said Matthias Knoll, managing partner at Knoll Maschinenbau GmbH.